Church of St Helen, Ranworth, Norfolk. 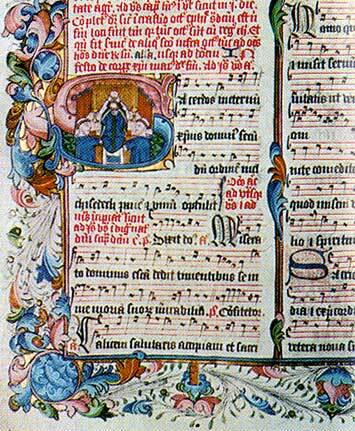 This Manuscript was illuminated by the monks of Langley Abbey in 1400. It was lost for 300 years before being found in a private art collection. This page is part of the order of service for the feast of Corpus Christi. The book was written on sheepskin, 285 pages. Picture: 'Treasures of Britain', AA, Drive Publications, 1968, page 404.